« Puree Duo of Pea & Rosemary and Carrot & Parsley Served with Grilled Pork. 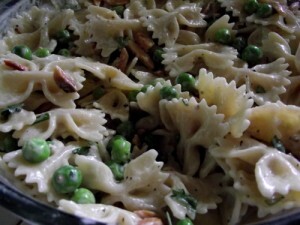 Perfect for the back yard BBQ or picnic in the park- pasta salad is always a huge hit in my house. I love it as a side dish or even just a big bowl for lunch. Yum. I like to do this when my local farmers market has fresh peas because they go perfectly with toasted almonds! Cook your pasta in well salted water and then rinse well in cold water to cool it down. Mix everything together while the pasta cools and then blend it with the chilled pasta. An optional ingredient would be a little grated Parmesan cheese. Yup- it’s really that easy!